“Bhai, chaar santra de diyyo,” a lanky lad drawls in guttural Haryanvi as he fishes out a soiled hundred rupee note along with a twenty rupee note from his stonewashed jeans. That’s 120 rupees in all, 30 rupees per santra. Only that ‘santra’ here, in south Delhi, is not the innocuous citrus but the orange-coloured country liquor (desi) sold in small 180-millilitre plastic bottles also called a pauwwa in the lingo of an ardent alcohol drinker. “These are mainly supplied from factories in Haryana. I do not know of any factories in Delhi,” says the turbaned hooch seller in his early 60s, seated on a matted cot amid the squalid surroundings. 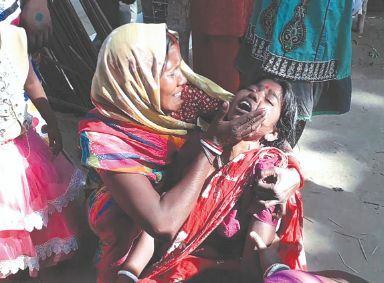 He hasn’t heard of the hooch tragedy in Assam’s Golaghat and Jorhat districts that claimed more than 140 lives mid-February, or the 100-odd lives in Uttar Pradesh and Uttarakhand in early February. “Must have been contaminated booze,” he says, furtively glancing around to make out thirsty souls or to spot a cop in his evening prowls. South Delhi’s upscale neighbourhoods hide many secrets, easy availability of cheap hooch among them. While the prosperous opt for expensive single malts, their gardeners, drivers, part-time maid’s husband, the guards, often opt for furtively-sold illicit spirits, easily available in the nearby slums. The accessibility and cheap price, make the brew a favourite way for the economically underprivileged. “Most of the hooch in Delhi is produced in Haryana and sold mostly in slums by an organized group mostly belonging to a particular tribe. To make fast buck, the country liquor is further adulterated with cheap substitutes,” says a serving senior Delhi police official on the condition of anonymity. On February 18, a Ministry of Social Justice & Empowerment survey report, Magnitude of Substance Use in India, stated that of the total 160 million people consuming alcohol, about 30 per cent, or about 48 million people, drink country liquor. According to WHO’s Global Status Report on Alcohol and Health 2018, India’s per capita alcohol consumption stood at 2.4 litres, 4.3 litres and 5.7 litres in 2005, 2010 and 2016 respectively. The report predicts India’s per capita consumption will increase further by 2.2 litres by 2025. There are several ways for the liquor to become more potent with the overarching motive of maximizing or earning profits: when cheap country liquor, brewed by license-holders, is mixed with cheap chemicals; bootlegged liquor which is easily adulterated with harmful substances; or a pure illegal operation involving a liquor den brewing a dangerous potion. Reports quoting Golaghat villagers said instead of making hooch from jaggery, the hooch makers mixed spirit with water and sold it openly in 5 litre cans. It really is the excess amount of methanol or methyl alcohol — added by an act of omission or commission — that makes the distilled spirit a killer brew. Easily available in the market for its industrial applications, methanol is intentionally added to make it much more potent. Hooch, or the colloquial ‘tharra’ or simply ‘desi’ as it is called in northern India, is a familiar story across the country. A report brought out by the National Crime Records Bureau (NCRB) attributed 1,522 deaths in the entire country due to consumption of illicit/spurious liquor in 2015 — the last available record. Nabeela Khan, deputy editor of Health Analytics, a portal on health data, questions it: “When it comes to deaths due to alcohol consumption in India, there is no reliable and updated data. NCRB data published in 2013 says close to 5,000 people died due to alcohol consumption whereas 2015 report says that about 1,500 people died due to consumption of illicit/spurious liquor in 2015. These figures highlight that there is a big void on alcohol deaths in India and huge information remains in shackles”. Tackling the issue of illicit brewing on a global scale, the WHO says: “Unregulated alcoholic drinks are generally very cheap and are therefore attractive to people with low incomes”. The global body recommends “bringing informally and illegally produced alcohol into the taxation system, implementing tax stamps, developing monitoring systems, and publishing warnings about the health risks”. But that’s easier said than done. Long years back, India began with a promise to end booze which was incorporated in the Indian Constitution’s Directive Principles of State policy”. After more than 71 years of Independence, only Bihar, Gujarat, Lakshadweep, Manipur, Mizoram and Nagaland prohibit alcohol in varying degrees. While the Directive Principles cannot be enforced in a court of law, a reason to completely ban alcohol possibly falters on the evidence of inefficacy of prohibition in the past across the globe besides the fact that the state cash kitty is dependent on revenues earned from the selling of alcohol. Prohibition also has led to the emergence of a huge black economy operated by organized gangs. So is a total ban called for? “Why is the government encouraging people to drink just for the sake of revenues? Please show me a single case which says alcohol benefits your body. Neither is providing cheaper and safer alcohol just to stop people from consuming the adulterated liquor a solution. I am for a total ban on alcohol consumption after having seen the way it harms people especially the poor,” says Dr SK Kalra, 63, a leading physician and prohibition activist in Agra. Says Vanlalruata, president of the Young Mizo Association: “We have a categorical stand against alcohol. Ban it. Mizoram being a tribal society, we have seen the adverse effects of alcohol. And making available safer and cheaper alcohol simply won’t make Mizo society safe”.